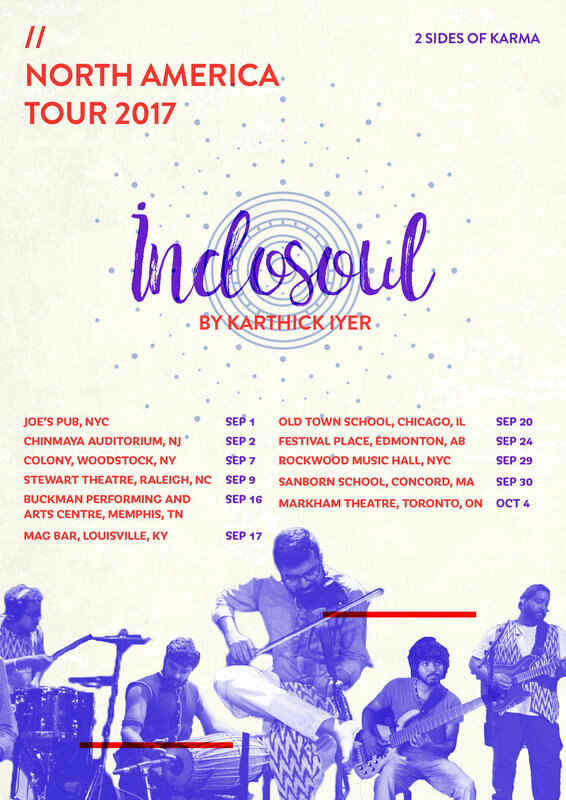 A tour in North America, the entertainment capital of the world, is every new musician’s dream come true and we at IndoSoul are just about to leave on our second such tour. We have an interesting set of songs from our third album ‘2 sides of Karma’ that we have been working on the past year and will be premiering them at the tour concerts. But before we step into the future, let's look at our journey so far. Back in 2013, we had started off by uploading our band videos on our YouTube channel: https://www.youtube.com/user/Thekarthickiyer and soon enough, that caught on like wildfire. IndoSoul's music reached out to listeners across the world. We started to receive requests for concerts from various places, ranging from Indian cultural organizations in U.S that wanted us to perform at their events to numerous requests from our fans to play in their city. We also found out that a huge chunk of our Youtube viewership came from the US and Canada next only to India. The time seemed ripe for a tour to showcase IndoSoul beyond our borders. In February 2015 we made an impulsive decision to plan a tour to North America for July-August the same year. This would be our first major tour outside India. After a hectic few months of planning the tour, we landed in Toronto to play our first concert there. Throughout the tour what enthralled us most was the number of people who had seen our videos online and had driven hours to come by and see our concerts. We got a lot of support online from our fans in the weeks leading up to the concert that added to the excitement surrounding the tour. Also, we were pleasantly surprised with the fact that Americans came to our concert too and had nice things to say about the spiritual element in our songs along with the familiarity of guitars and drums. Two of our favorite concerts were in Toronto and New York. We played to a packed auditorium at the lovely Markham Theater for our first concert. It was a truly magical experience for us to play in such a beautiful venue and to a great crowd. Rockwood Music Hall, New York City was the last show of the tour and was scheduled on a Wednesday night. This was the first non-weekend show of the tour and we weren’t quite sure of the audience turnout. But New York City stayed true to its character and people showed up for the concert in large numbers even though it was a weekday. It took nearly forty-five minutes for the crowd to come in and get settled owing to the large amount of people who had come out to watch us. We found out later from our photographer that people had been lining up for a few blocks outside the venue to get in. The show was a very intimate gig, with the closest people in the audience just a few feet away. During the tour, we had some free time on our hands that we spent at a studio called “Magic Garage”, where we composed five songs that would form a part of our next album 'Two Sides Of Karma’. After these experiences, it goes without saying, that we wanted to tour the US again, but this time with new material and with some of our old favorites as well. Musically, the next tour will bring to the audience brand new stuff from our new album along with a lot more vocal numbers. We are in fact, very excited to play at some of our venues. Our first concert will be at the iconic Joe's Pub, NYC followed by a show at the much revered Chinmaya Mission Ashram in New Jersey. Another exciting concert is the one at the artist filled town of Woodstock the birth place of music festivals as we know it today. We also have a few concert spots like Raleigh and Toronto that we'd be visiting again thanks to the warm and overwhelming reception we received the last time. What we hope to take forward with these tours is to make Indian Classical music more approachable to people who have grown up listening to other forms of music. This is the mission for us at IndoSoul. To do this we take strains of music from different genres such as Rock, Pop, Jazz, RnB etc and blend them with our classical music to perform music that is Indian at its core and yet global in its sound.